This week in the summer lawn disease spotlight is brown patch disease! With all the warm and wet weather we’ve been having here in northeast Ohio, the conditions are prime for this disease to pop up in your lawn. No one wants that to happen though, so learn how you can spot and treat it now! 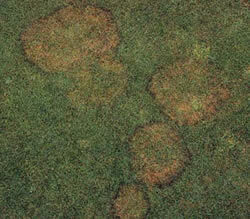 Brown patch is caused by rhizoctonia solani fungus. It’s very common when temperatures are high and grass is left either damp or wet. Lawns with compacted soil will be more vulnerable to Brown Patch too. This disease will infect and kill grass blades, leaving your once green lawn with brown patches (hence the name brown patch disease). Luckily, this disease will not kill the plant itself, just the blades. If your lawn already has Brown Patch, then it can be treated with a fungicide treatment. You can also aerate your lawn to reduce the compaction throughout the soil and it will also air out the infected soil. After an aeration, you can reseed with a grass type that is more resistant to the rhizoctonia fungus, which will help prevent your lawn getting Brown Patch in the future. Read even more about Brown Patch and prevention techniques in our previous article here. You don’t have to do it all alone! Let a professional help! Certified lawn care technicians are trained to recognize and treat lawn care diseases as soon as symptoms show. Learn what you should know when it comes to hiring a professional in our FREE Hiring Guide! Just click below to download your copy today!